At the Family Fertility Center in Bethlehem and Clarks Summit PA, our IVF and IUI success rates are not only measured by the number of couples and individuals we have helped to bring their dreams come true. It is defined by the entire process leading up to that happy ending. Success is achieved when you ask questions and the staff take time to provide you with answers for all of your concerns. Success is accomplished when you participate in the decision of what treatment option is best for you and can begin that treatment with full confidence. Success is realized when you feel the care and get the encouragement you need when it seems like there is no hope. Success is reached when the entire team at the Family Fertility Center applies their combined knowledge and individual skills to help you with your quest to become a parent. Family Fertility Center has a general policy of exhausting less aggressive and more affordable non-IVF treatment, unless it is medically futile, before IVF is attempted. Many of our patients were told at other clinics that they must do IVF but successfully conceived with non IVF treatment at our Center. We have an uncommon commitment to treat every individual or couple uniquely, taking into consideration the medical diagnosis and severity of their infertility, limitation of financial resources, tolerance for risk and emotional stress, religious belief and personal value before a particular course of treatment is recommended. And with high success rates, we offer our services to our patients in Lehigh Valley, Poconos, Harrisburg, and Bloomsburg PA areas, as well as New Jersey and New York. IUI data with or without ovulation induction or super-ovulation are not required to be submitted to the federal government. Hence there is a paucity of information on how diligent clinics are with their non IVF treatment. Paradoxically clinics that give a less than full faith effort to non IVF treatment are “rewarded” with patients who are more “successful” with IVF treatment. In 2008 we reviewed our IUI cycles from 2000 to 2007 to study the impact of low sperm morphology on pregnancy outcome. We presented our data at the 2008 Annual Meeting of the American Society for Reproductive Medicine (Abstract 650765). Below is a summary of our IUI data. 1. The likelihood of pregnancy, about 16-21% per cycle, does not seem to be affected by the percentage of normal sperm morphology by Kruger strict criteria. 2. There is a slight but non significant statistically trend towards more miscarriage among women whose partners have less than 5% normal morphology by Kruger criteria. Live birth rate per cycle was 15% but dropped to 11% if normal sperm morphology was 4% or less. 3. 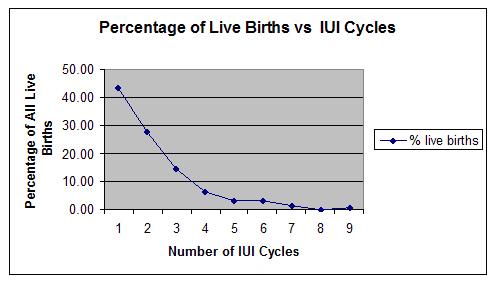 The likelihood of a successful live birth with IUI declines significantly after three to four cycles of IUI, consistent with other studies on IUI success. When choosing a fertility service provider, couples and individuals instinctively will try to compare programs based on success rates. Many IVF programs and clinics publish “success rates” even though the CDC and the Society for Assisted Reproductive Technologies (SART) emphatically insist that head-to-head comparison between clinics is not meaningful without considering the patient population and the practice style. Rates vary considerably, for example, due to differences in the rigor a clinic put into its non-IVF treatment program, the selection or exclusion process prior to IVF, the cancellation policy, the stimulation protocols, the number of embryos to transfer, and the value they place on the risk of avoiding high order multiple gestations. Thus, a center-by-center comparison of results is not valid. When it comes to IVF, Family Fertility Center prides itself on being very inclusive. We aim to give patients the best estimate of their predicted success, yet leave the final decision as to whether to attempt IVF to the individual patient. We strongly believe patient autonomy supersedes the self serving goal of optimizing an individual clinic’s success rates by limiting access. We do recognize, however, that individuals and couples would like the assurance that they are choosing a “successful” program and so we are providing the following information as a starting point to evaluate our program. 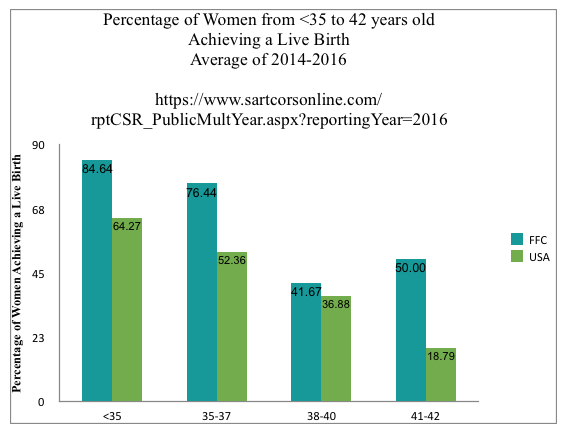 We present our data only in live birth rate per cycle start. Live birth rate is the only rate that matters to the patient. Furthermore presenting the data in cycle start eliminates any confusion and manipulation of data. Please keep in mind that individual or couple success rate may differ due to a variety of factors unique to that individual or couple. We submit our statistics yearly to the Society for Assisted Reproductive Technology (SART). Please click here to view our latest success rates on its web site. A comparison of clinic success rates may not be meaningful because patient medical characteristics, treatment approaches, and entry criteria for ART may vary from clinic to clinic. 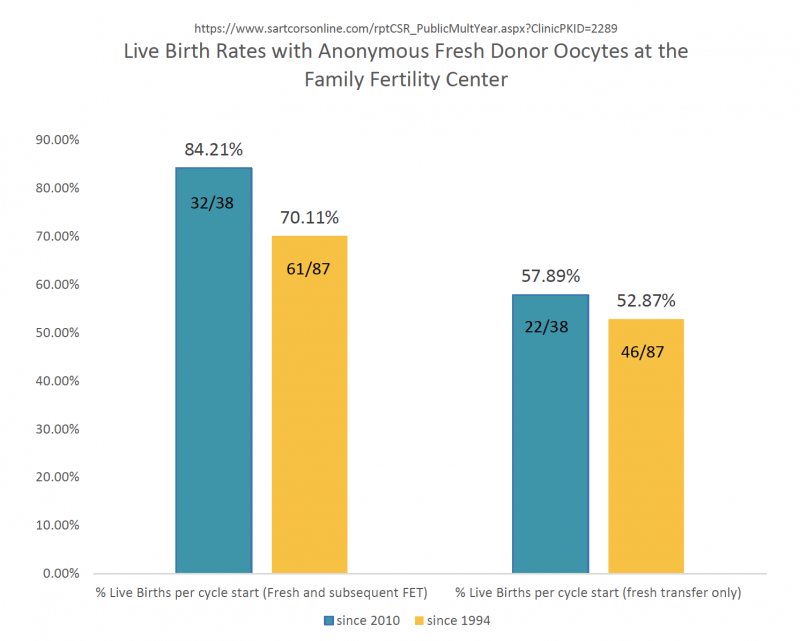 Family Fertility Center does not share oocytes among different recipients. Typically recipients of anonymous oocytes have experienced numerous non-donor treatment cycles failure. We do not believe it is in the best interest of the recipient to share oocytes and compromise their success unless two or more recipients arrange between themselves an agreement to share donor oocytes.